Assignment – this activity provides a space into which students can submit work for mentor/consultants to grade and give feedback on. Choice – this activity allows mentor to ask a question and set up radio buttons which student can click to make a selection from a number of possible responses. Forum – this activity allows students, mentors consultants to exchange ideas by posting comments as part of a ‘thread’. Files such as images and media maybe included in forum posts. The mentor can choose to rate forum posts and it is also possible to give students permission to rate each others’ posts. Wiki ­­– this activity is a collection of collaboratively authored web documents. Basically, a wiki page is a web page everyone in Learning Room can create together, right in the browser, without needing to know HTML. A wiki starts with one front page. Each author can add other pages to the wiki by simply creating a link to a page that doesn’t exist yet. Workshop – this is a peer assessment activity with many options. Students submit their work via an online text tool and attachments. There are two grades for a student: their own work and their peer assessments of other students’ work. Book ­­– this module makes it easy for Mentor to create multi-page resources with a book-like format. File Folder – a folder allows a mentor to display several course resources together. 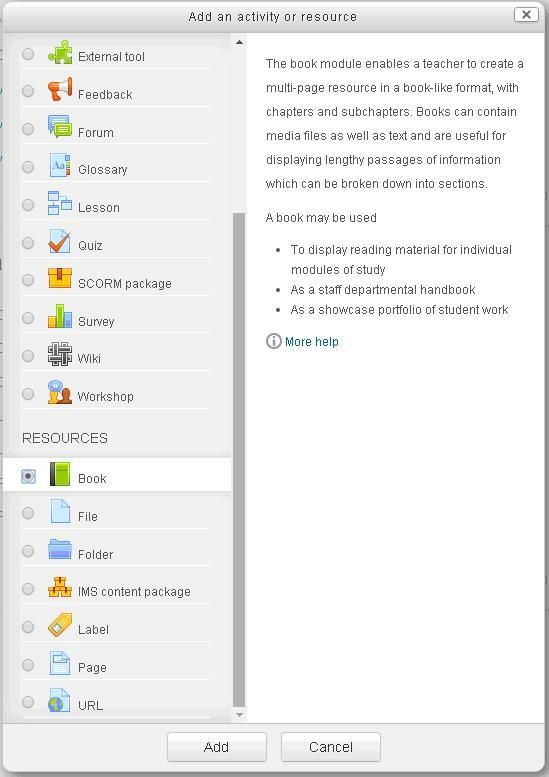 The resources may be of different types and they may be uploaded in one go, as a zipped folder which is then unzipped, or they may be added one at a time to an empty folder on the course page. Page ­­– a page resource creates a link to a screen that displays the content created by the mentor. The robust Text editor allows the page to display many different kinds of content such as plain text, images, audio, video, embedded code or a combination of all these. URL ­­– a URL (Uniform or Universal Resource Locator) is a link on the internet to a website or online file. Mentors can use the URL resource to provide their students with web links for research, saving the student time and effort in manually typing out the address.